Pēteris Bērziņš was born on 16 March 1957 in Cooma, Australia, of Latvian Orthodox refugees, Leonid (1921–1996) and Margarita (b. 1924) Bērziņš, who were forced to leave their homeland during the Second World War. He grew up in Cooma and graduated with a philological degree from the Australian National University. He was fluent in ancient Greek and Latin. In 1982, he entered Holy Trinity Monastery in Jordanville, New York, and enrolled in Holy Trinity Seminary. He graduated from the seminary in 1985. He was tonsured to the mantle on 16 March 1985, by Archbishop Laurus (Shkurla) of Syracuse and Holy Trinity and ordained hierodeacon on 12 April 1987, also by Archbishop Laurus. From 1992-1996, he served as father-confessor at Gethsemane Convent in the Holy Land. In 1994, he was awarded the gold pectoral cross by Archbishop Laurus. From 2001-2005, he served again as father-confessor at Gethsemane Convent in the Holy Land. In September 2005, he was elevated to the rank of hegumen by Metropolitan Laurus. From 2005 to 2008, he ministered to Ss. Sergius and German of Valaam Community of the Diocese of Chicago and Mid-America. In May 2008, the Council of Bishops of the ROCOR designated him as candidate for the Caracas cathedra. Hegumen John was consecrated Bishop of Caracas on 21 June 2008, at the Old-Rite Church of the Nativity in Erie, Pennsylvania. Officiating at the consecration were Metropolitan Hilarion of New York and Eastern America, Bishop Daniel of Erie, and Bishop Peter of Cleveland. 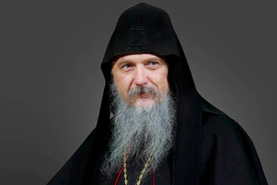 On 26 October 2010 he was appointed head of the Old-Rite parishes of the ROCOR. He speaks Russian, English, Latvian, Greek and Latin languages, and studying the Argentine dialect of Spanish.